Lauren Bacall is an American actress with a film career that lasted well over 60 years, but is perhaps best known for her on screen and real life relationship with Humphrey Bogart. As is often the case with famous people, her life and career were dominated by a T Square. She has the Moon in Aries in the 10th house of career. The Moon in the 10th house often points to someone who achieves a prominent career position at a young age, and in Aries indicates the sudden burst through to global stardom at the age of 19. The Sun / Moon combination of Virgo and Aries shows the drive and hard work that sustained her career for so long. The Moon is in opposition to Saturn in the 4th house. This combination invariably causes trouble for one’s family and home life as Saturn usually brings a sense of emotional loss. in a child’s chart, Saturn often has a connection with the father figure and Lauren Bacall’s parents divorced when she was five and she no longer saw her father. Saturn in a chart often seems to cause unnecessary suffering particularly when it impacts so young. The planet’s role, however is to force people to get along by their own efforts and to build a stronger inner sense of themselves being less dependent on external circumstances. In a truly positive response to Saturn she enrolled for a year at the American Academy of Dramatic Arts aged 15, supporting herself by modelling and ushering at Broadway shows. When she appeared on the March 1943 cover of Harper’s Bazaar, her picture caught the eye of director Howard Hawks, who imported her into Hollywood. Saturn also rules old age and the Moon in aspect to Saturn will often bring relationships with older partners. Psychologists might say that she was looking for the father figure that she had lost in childhood when she married Humphrey Bogart who was 25 years older than her. The marriage lasted for 12 years until Bogart’s death and in many ways it defined her as an actress. The opposition between the Moon and Saturn focuses by T Square onto Venus. An apex Venus guarantees a strong magnetic attraction and its shared by many of the world’s most beautiful women. In Bacall’s chart, Venus is even more powerful as its in the 1st house and widely conjunct the Ascendant. Venus and the Ascendant are brought closer together by the fact that the Ascendant is also in the T Square. The Ascendant rules the physical body and the projected image. No wonder Bogart instantly fell for her. When Bacall played her first role opposite Bogart in ‘ To Have and Have Not ‘ she was so nervous that she shook, and for the famous scene in which she says, “Anybody got a match?” she held her chin down to control her shaking, looking up at Bogie, a famously seductive look that became known as Bacall’s trademark. The timing of all this was astonishing. 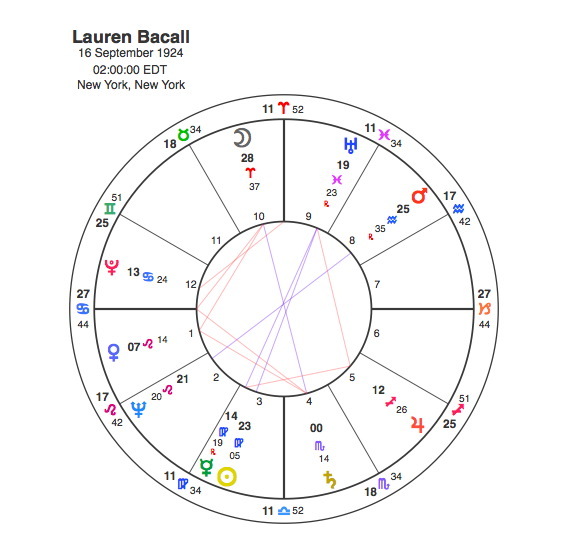 Pluto was in Bacall’s T square from 1936 to 44, in square to her Moon and Saturn during her teens as she was propelled towards a career in acting ( Moon in Aries in the 10th ) and forced to support herself owing to the lack of a father figure ( Saturn in the 4th ). Inevitably Pluto was conjunct her Venus in 1944 for ‘ To Have and Have Not ‘. Given the strength of Venus in her chart this was probably the most powerful transit of her life and propelled her to instant global stardom and marriage to Bogart. Pluto’s next connection with her T Square was in 1957 when Bogart died of cancer. Pluto was trine her Moon and sextile Saturn. Trines and Sextiles do have an effect but they are not as significant as conjunctions, oppositions and squares and Capricorn Research is interested in simplifying things as much as possible so they are not generally used. In this case, however, it makes sense to include them as there is another aspect pattern in Bacall’s chart called an Easy Opposition where the Moon and Saturn are connected to Mars in the 8th house of death by sextile and trine respectively. So when Pluto went through this contact with the Moon and Saturn it was also opposite Mars. If ever a transit symbolised the death of an older husband it would be Pluto opposite Mars in the 8th in aspect to the Moon and Saturn. Pluto was still transiting her Moon and Saturn opposition during Bacall’s brief relationship with Frank Sinatra who was 9 years older than her from 1957-8. It was as if she could not face life without an older partner. Sinatra apparently broke off the relationship once it had been leaked to the press. Lauren Bacall married Jason Robards Jr in 1961, she is the only Oscar winner to have been married to two other winners. The couple divorced in 1969, apparently largely because of Robards alcoholism. Pluto was conjunct Bacall’s Sun in 1969. Lauren Bacall’s screen career was legendary but in her personal life from her absent father and through her marriages she experienced the full effect of the Moon / Saturn opposition in her chart which expressed itself neatly in the title of her debut film – To Have and Have Not.